My husband and I were so excited to visit my sisters in their new home in Florida. We packed the car with 2 weeks worth of provisions and our two dogs, Icy and Phoebe, and off we went! It had been years since I'd been to Florida, I was so excited to go, especially with my dogs! It would be Icy's first time in Florida, and although we don't know my rescue dog Phoebe's history, she probably hadn't been there either. There were so many things I wanted to see and do when we got to Florida. I really couldn't wait to see how the dogs would enjoy playing on a dog friendly Florida beach. One of the things I was looking forward to most was staying at a particular pet friendly hotel. 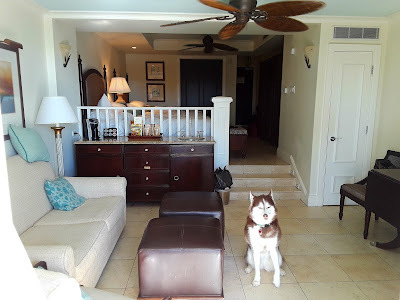 I had been dreaming about visiting the dog friendly Kimpton Hotel in Vero Beach, Florida since I discovered it 4 years ago! This boutique hotel chain is a big step above the norm for dog friendly hotels. For one thing, they don't specify "small dogs only" like most of the higher end dog friendly hotels do. It's located right on the beach and is quite luxurious. It was gonna be Perfect!! Or so I thought. 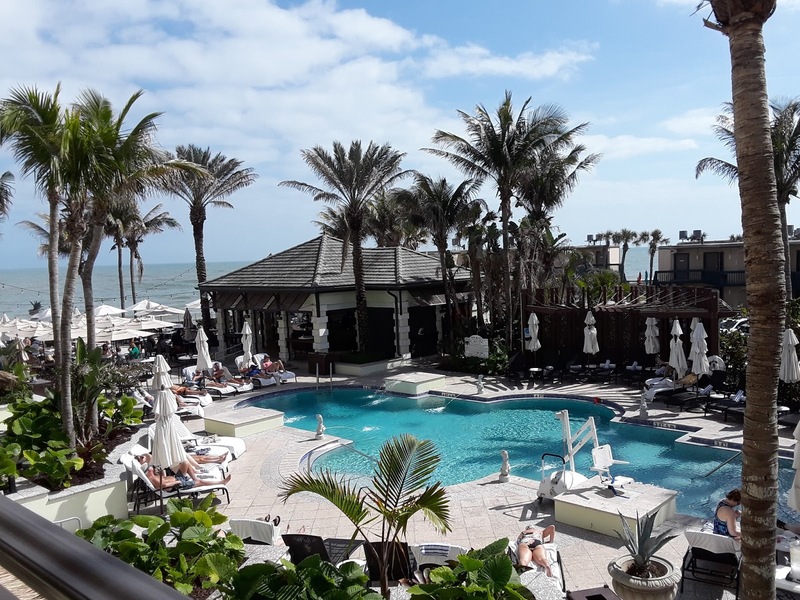 Stunning view of the pool area, and the ocean to the left, from our hotel room balcony. Sure, the spacious room and bathroom were pretty much to die for, especially for a hotel that allows dogs! 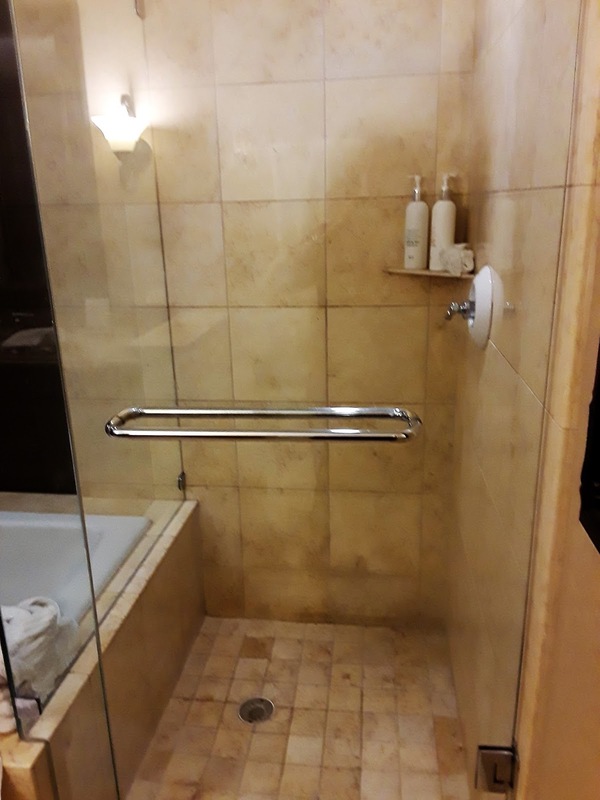 You could open a panel from the bathtub and see straight out to the balcony! So... what's the problem, you ask? In my mind, there are two kinds of dog friendly hotels. Those that are truly dog welcoming hotels and those that are mostly dog tolerant hotels. The former are those pet friendly hotels that truly GET IT. They understand that my pets are family and part of my vacation fun. The latter are hotels that allow dogs and other pets but they don't really do much to make pets feel welcome. Instead, they impose lots of high pet fees, restrictions, and rules. For me, a truly dog welcoming hotel is a necessity. If a hotel doesn't welcome my dogs, I might as well leave them home! They are my furry family members and I love to vacation with them. 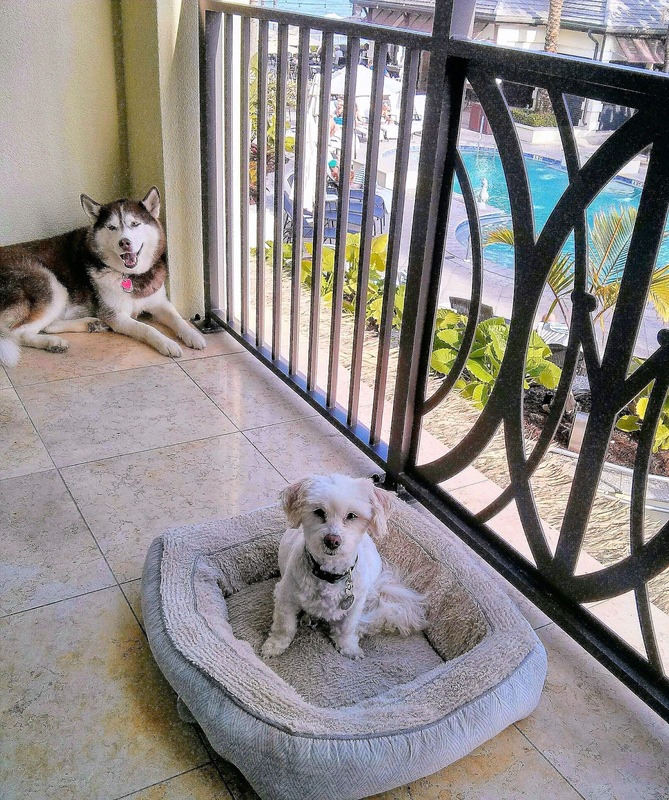 My ideal vacation with my dogs includes pet welcoming hotels and dog friendly activities. If there's nothing for them to do or be included in, I might as well leave them at the PetSmart Hotel, where they can play in doggie day camp and have fun with other dogs. Immediately upon checking in I was handed a Pet Policy to sign stating that my dogs were basically Not Allowed anywhere in the hotel except in our room. It stated that if we left the room, our dogs had to be crated . I do not crate my dogs at home and leave the house so I'm not going to do it in a hotel. They are super well behaved. If they weren't I wouldn't bring them to a seaside hotel. My dogs were not welcome on either of their restaurant's outdoor patios. The patios were quite spacious, so Why Not?! I was very disappointed, that is not very dog welcoming. The only flooring throughout our room was tile, which is cold. Being a Siberian Husky, that's great for Icy, but not for my little warmth-sucker, Phoebe. They didn't provide a pet bed in the room and one wasn't offered. After we got to our room I saw how cold it was and that Phoebe was uncomfortable. I called the front desk to ask for a pet bed. They brought us a pet bed that clearly hadn't been cleaned. There was hair all over it and dirt was lodged in the edges of the bed. I had to shake it out and use a lint brush on it myself. However, Phoebe loved that bed and spent most of her time snuggled up in it so I can't complain TOO much! Many upscale pet friendly hotels provide a pet bed in the room or offer one upon checkin, which is very welcoming. Throughout our stay, no one even offered me a biscuit for my two dogs! Most dog friendly hotels have a little something to welcome their furry guests upon arrival; a biscuit or dog treat, a bed, poop bags, something! I knew in advance that although the hotel is right on the beach, no pets were allowed on the beach. That is a Vero Beach town rule, so it's not their fault. It was a shame though. The hotel has no self parking, only valet (daily fee) which makes it difficult when traveling with pets. I don't know about you, but we often need to get into the car to grab some pet related item or other. Their parking garage was large so I wish they offered self parking as well, but that's not really a pet friendly point so scratch that complaint. Think I'm being too picky? Think I should be grateful that any hotel allows our dogs? Let me tell you, for the prices they charge at this place I think they should include a full on Spa Day for my dogs! Don't get me wrong, I'm not saying it's a bad place to stay with dogs. I'm just saying there are hotels that are far more welcoming to pets. Which brings me to the second half of my Tale of Two Dog Friendly Hotels. 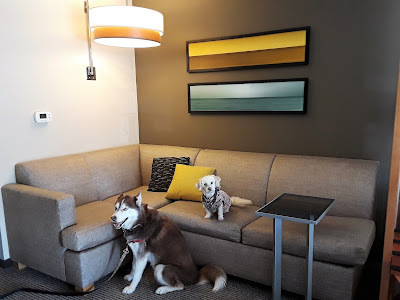 I found dog friendly Hyatt Place Hotels quite by accident when we drove down to Myrtle Beach for a BlogPaws conference. We needed a pit stop along the way so I settled on Fredericksburg, Virginia. When searching for pet friendly hotels in the area I happened upon a Hyatt Place Hotel. I've heard of Hyatt Hotels of course, but wasn't familiar with their Hyatt Place Hotels. Icy and Phoebe relaxing in the beautiful Hyatt Place Hotel in Fredericksburg, VA. They LOVE the Hyatt Place hotel! Imagine our delight when we found this lovely Hyatt Place Hotel that welcomes pets! Actually, by dog friendly hotel standards, it's gorgeous and beautifully updated! Their fee was reasonable and they welcome up to two dogs 50lbs and under. I've been told however, that larger size dogs can be accepted at Hyatt Place Hotels, at Management discretion. Call in advance, of course. Check out this beautifully updated, spacious room! We are so comfortable in this hotel. We've stayed at the Hyatt Place Hotel in Fredericksburg 4 times, we just love it! 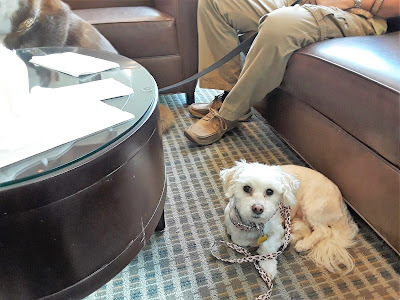 My exhausted dogs and husband relax upon arrival at the Hyatt Place Hotel in Fredersburg, Virginia. The Management and Staff at this particular hotel are fabulous. It's such a pleasure going there. They are so welcoming to us and to our dogs. They always want to pet and love on Icy and Phoebe, and they always offer them biscuits! Just outside the hotel is a really pretty walking path with wide sidewalks and a convenient poop station. We really look forward to our morning walks with the dogs at this hotel. They don't pummel us with rules of what we can't do with our dogs, they welcome them! The vibe is just great here. 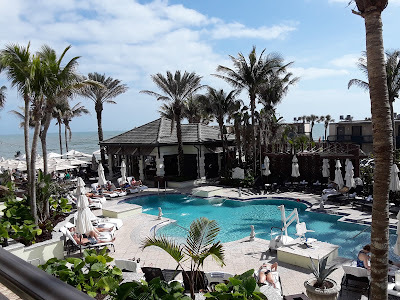 Because we've had such great experiences at the Hyatt Place Hotel in Fredericksburg, we looked for a Hyatt Place Hotel in West Palm Beach Florida where my sisters live. We found a great one, right in downtown West Palm Beach. Not only is the location perfect, but the staff are so sweet. They really liked our dogs and treated us so well. Again, they didn't pummel us with rules about where they can't go, they welcomed Icy and Phoebe. We even saw dogs hanging out at the bar with their owners! I'm not sure that's really allowed because they do serve some food in that area, but no one complained. I didn't dare bring our dogs into the bar though, I was too timid LOL! We hung out with them in a corner of the lobby one afternoon and no one had any issue with it. Cooling off with Icy and Phoebe in the Hyatt Place Hotel lobby after a long walk around West Palm Beach, FL. During our stay in West Palm Beach, Icy and Phoebe were so comfortable and happy at this hotel. We had no issue leaving them in the room for short periods of time while we went out for a few meals. Honestly though, there were so many things to do with the dogs in the area they didn't need to stay in the room alone much at all. The staff was great about actually calling to say they noticed we had our Do Not disturb sign on the first 2 days, and asked if we needed any towels or cleaning. If so, they wanted to know when it was convenient for us to have them come into the room. How nice is that!? Our stay at the Hyatt Place Hotels was so pleasant and comfortable, we loved every day we were there. I can't wait to stay there again! I'd still recommend the Kimpton Hotel in Vero Beach, I just wouldn't recommend bringing pets along if you don't want them confined to the room all day or if you don't plan to take them on outings away from the hotel. Psst!! In my next blog post, I'm going to let you in on a little secret - what the Best dog friendly beach on Florida's East Coast is! Stay Tuned! 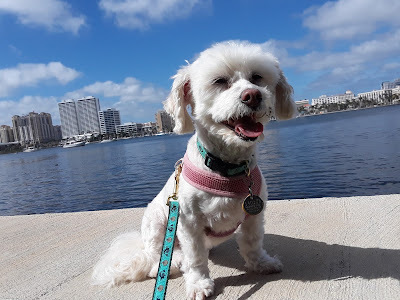 I'm definitely adding Florida to my list of great dog friendly vacation spots! Want to see more great places to take your pets on vacation? Check out my post on Great Dog Friendly Vacation Spots! THIS IS THE RASCAL AND ROCCO PET PARADE BLOG HOP!! Whenever my wife and I travel, we normally don't bring our dogs (much to my dismay! ), but next time we do, I'll have to remember your point that "there are two kinds of dog friendly hotels. Those that are truly dog welcoming hotels and those that are mostly dog tolerant hotels." Oh definitely, hotels can be very different! Go Hyatt!! Good for them - if I need to stay in a hotel THEY get MY business!! You are right- there IS a difference between dog friendly and dog tolerant! I would rather be at a hotel that was WELCOMING to dogs over little kids personally HAHA sorry but thats the woof! We loved the Hyatt Place so much, they really know how to welcome dogs! Yes, there's definitely a difference! I don't care too much about supplies as we're usually toting half a pet store anyway. But dogs being welcomed everywhere where they're not serving food is a definite plus. We went to one hotel where dogs were allowed at the daily free happy hour and Mr. N got to gorge on smoked salmon. This was really informative. I never thought about hotels in two separate categories, but that welcoming feeling towards your dog can make all the difference! Often you'd expect a pet-friendly hotel looking pretty shaggy. These look wonderful. Thanks for hopping with the Pet Parade! I totally get the difference in hotels when it comes to dogs. The problem is bad pet parents that don't clean up after their dogs. We have stayed at some really nice places with the boys and it is disgusting to take them outside due to all the poop left behind. I'm glad that y'all had a great vacation! I'm glad you found another hotel that was pet welcoming! I was just reading about someone else's positive experience at a different Kimpton Hotel in another state. I wonder how much of their pet policy is affected by local management. Considering what a niche they've got with their advertised pet perks, you'd think they'd be more than tolerant. Oh my I really feel for you with that first hotel Kimpton. I can understand the frustration when they want to charge an arm and a leg and then give you a bunch of rules on top of that. I've never stayed at a Kimpton hotel however like you, I have stayed at a Hyatt Place in NY. Only once and even though the location I went to was not full service hotel, the staff was friendly and very accomodating the best they could. I didn't come with my pets however for a quick getaway and it was great. Nice contemporary clean rooms and friendly staff and affordable! So glad you and Phoebe and Icy had a great time at the latter location. I guess it all worked out well in the end. I am with Kamira on this one. I feel your upset and your lack of a friendly welcome. That is NOT dog friendly at all. Yes, a lovely hotel, the staff may have been courteous to you UT critically the hotel was not welcoming. I hope they read your review and take on board what are legitimate concerns. This might require a major policy shift but would gain them many friends. The second hotel? HEAVEN 'nuff said... Well done Hyatt Hotels Good job and you just got added to our hotels we will like to visit list. Wow...while the Kimpton looked so fantastic, I can certainly agree with you. Their rules, for a pet-friendly place, can make it very unfriendly! I am glad you found wonderful accommodations at the Hyatt and are enjoying all your Florida activities! I am a little envious of the beach season you are having! ;-) When travellng for work, I have always been very happy with the Hyatts...although I was unable to bring any of my dogs, my stay was always warm and welcoming. Enjoy visiting your sisters! Can't wait to hear more of your visit! That's a shame that the first hotel wasn't more welcoming to Icy and Phoebe. I'm glad that the Hyatt Place Hotel is such a nice place to stay with pets. I stayed at a "pet friendly" hotel last spring with my sister and her dogs, and I was surprised by the rules. Like the one you stayed in in Florida, it didn't seem all that pet friendly to me. What a shame the hotel was dog tolerant, but not dog friendly. Unfortunately, not all people with pets are responsible owners like you are and they make it bad for everyone else. I can't wait to hear which hotel you think is the best. Perhaps some hotels should advertise themselves as "pet tolerant" instead of "pet friendly". Obviously, some have opened their doors to pets because they know that's important for business, but they don't really get it. Now if only their were a way to discern the difference before you book a stay at a place! They should have told you 'bout the cratin' business WHEN you were bookin', so that you would know it wasn't a good fit with your family. Not tellin' you was sneaky, for sure. MOUSES! Gosh, that's kind of false advertising with the Klimpton Hotel. I like your idea about distinguishing between pet tolerant and pet friendly. I didn't know that Hyatt Place Hotels were pet friendly. I have noticed them advertised but never stayed at one. I will check them out the next time I'm traveling whether Ruby is with us or not. Interesting post! My fiance and I haven't taken a vacation together in over 10 years, and are considering taking one this summer. The dogs will be coming with, of course! You brought up some things I never would have thought of when looking into pet friendly hotels. Those both sound like such great pet friendly places to stay. I have heard a lot of great things about Kimpton and hope to stay at one someday on our travels with the pups. So many pet-friendly hotels are pretty bleh and unimpressive. Kimpton looks awesome! I am so glad you wrote about the difference in dog welcoming and dogs allowed hotels. So many people don't understand the difference or don't know about it. Whenever we travel with Scooby, we try to stay at dog welcoming hotels. Nothing makes a vacation a little better than knowing the place you chose enjoys seeing your pet also. This is why we will go the AirBnB route every time. I have come to dislike staying at hotels. Even the good ones. Especially in North America where I can't dine indoors with my pet and thus am at the mercy of the weather Gods. Also vegan so ... making our own food is way easier to manage. :) win win for us. But it's nice to know they are out there if needed! Pet friendly hotels I mean.